Microsoft's Windows operating system has been extremely successful, primarily due to its power and flexibility as a platform for an exceedingly large portfolio of applications. Yet, this flexibility is derived from a complex architecture built on a central point of control known as the Windows Registry. The challenge of this type of flexible architecture is that portions of it may be altered without any notice the user or IT administrator. Applications may operate as expected one day, present surprising behavior another day, and later stop working altogether. The problem frequently lies hidden in a process that did or did not start, a system service that was turned off, or corruption in the registry that prevented the application from working properly. Most endpoint management solutions are based on installing agents, small pieces of software designed to monitor and control all operating system functions ...yet are too frequently unable to resolve the troublesome Windows issues. Installing agents everywhere is a time-consuming, staff-intensive process that isn't foolproof. Bottom line is that an organization is subsequently exposed to unnecessary instability or security and compliance risks. Windows and most major Windows applications already offer a number of access points for agentless management. 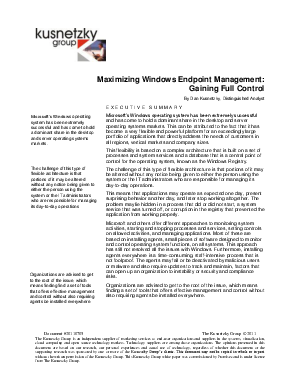 The best approach in maintaining effective management control of Windows endpoint systems is working with agentless technology that can quickly gather information, analyze that data, and recommend or remediate needed changes as required. Promisec's agentless technology is examined as a means of closing the endpoint compliance gap so prevalent in today's IT infrastructures.